I was most honoured to receive, last week, a review copy of the latest work of one of the grandfathers of legal blogging. 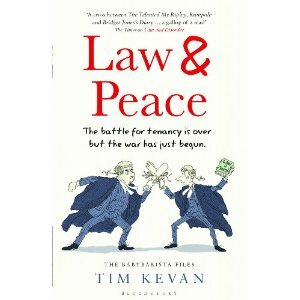 Written by accomplished legal author, Tim Kevan, “Law and Peace” will hit bookshelves, both physical and virtual, on 3 May 2011. Having just started reading it, I can report very promising signs so far. I hope it will be as enjoyable as Tim’s first masterpiece, BabyBarista and the Art of War, which was first given to me by a friend at my former law firm as a piece of inspiration for legal blogging. I look forward to reporting back more on this book, but for the meantime, I’ll leave you with some intriguing blurb and reviews of Tim’s other works.